Do you not recall that I am feeling all time warp-y this week? I assure you, it has nothing to do with the sick baby whose HUGE top front tooth is also finally pushing through and who was crying, and crying and crying last night. (Poor thing.) Nope. It is simply because I felt like switching things up. In any event, last night was a meal as quick and easy as they come. Also? Pretty darn healthy. Now let me start by saying that I feel pretty comfortable making stir fries. My dad is a vegetarian, so we ate tofu stir fry pretty frequently growing up. That being said, I have heard rumors (in a very enthralling gossip mill) that some people are intimidated by stir fries. 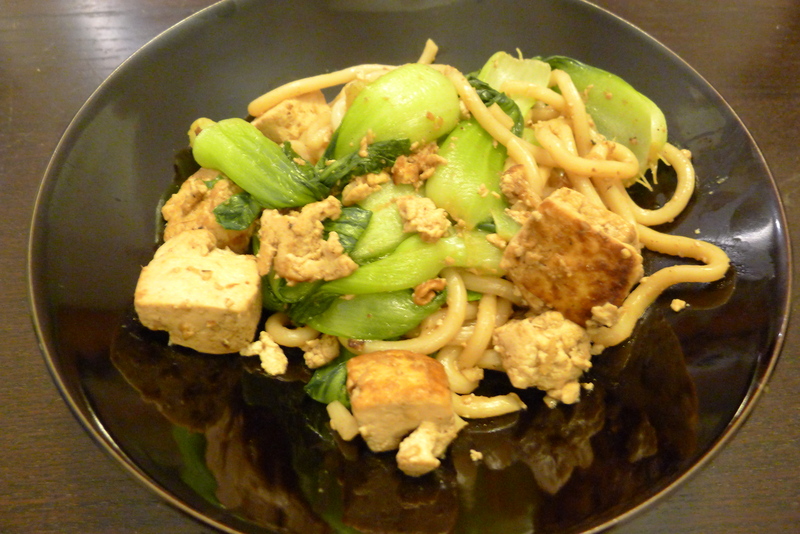 Tofu and Baby Bok Choy Stir Fry over Udon Noodles (The name is actually trickier than the recipe. ): This served all four of us. Double or half your recipe accordingly. And God Help Bless You if you are doubling it because you have 6 children. Also, once you start making stir fries, the possibilities are endless. Use any veggies you want. Switch out the noodles for brown rice. Or, if you don’t have little ones who need to eat carbs, leave out grains entirely. Have FUN with it. 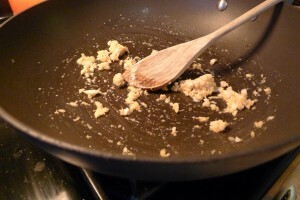 Put a few splashes of sesame oil in a wok or big frying pan and turn the heat to med-high/high. Add the finely chopped, or grated, ginger and garlic and stir. As I really figure out this whole ‘food blog photos’ thing, I will do things like clean my stove top before photographing it. For now, enjoy seeing the truth. While the ginger and garlic heat up, pat down the tofu with paper towels to remove excess moisture and cut it into 1 inch cubes. Pour a few splashes of soy sauce into the wok and then add the tofu, moving around frequently. 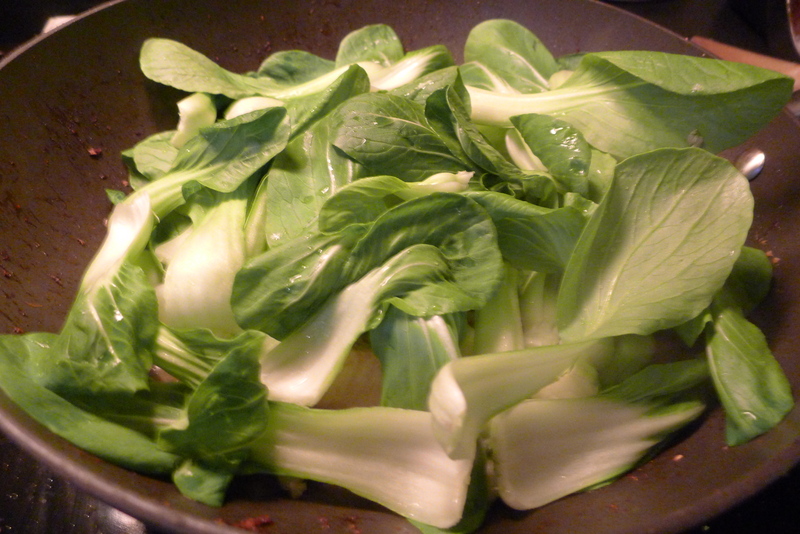 While it cooks, wash the baby bok choy and separate the leaves. 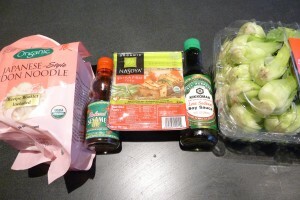 Once the tofu seems slightly browned, add about a 1/4 cup of water to the wok and then toss in the baby bok choy. Splash a little more soy sauce on top. Stir it around for about 1-2 minutes, getting the baby bok choy down to the bottom of the wok to cook in the water/soy sauce. Baby Bok Choy: How do you like me, now, Tofu? You think just because you’re the prooooteeein, that you’re so special. Well, I’m special, too! Tofu: Get off of me! I can’t breathe! Uncle! Uncle! Unnnnnncccccle! 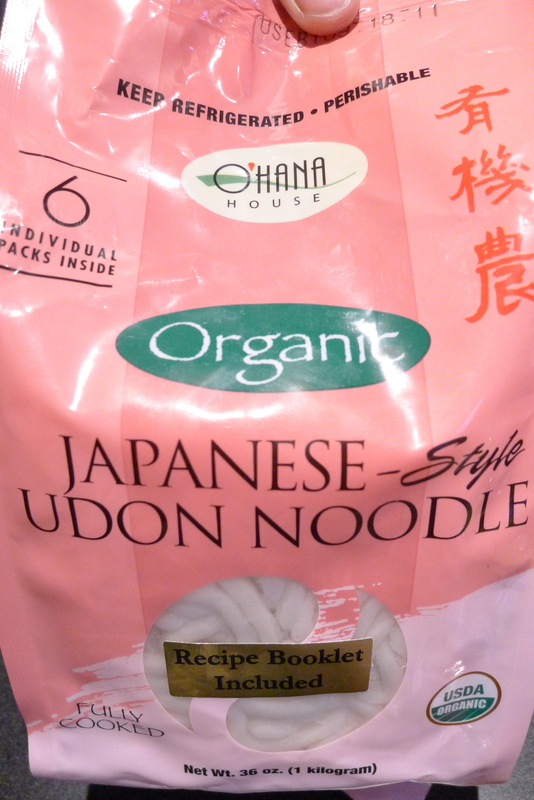 Place the Udon noodles in the bottom of the wok, underneath everything else and once they start to soften, gently break them up with your wooden spoon and mix them together with the other ingredients. By the way, these noodles are amazing. Find them. Get them. I found them at Costco and they are a life saver. On nights where Carlitos needs to eat something different, or additional, I take one packet, throw some milk, cheese and butter on top and micro it for 2 minutes. 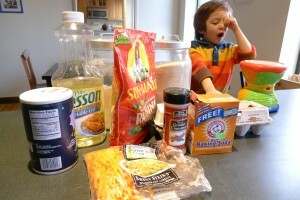 Stir it and you have made the easiest, quickest and most delicious mac n’ cheese ever…and they are organic! Serve your fabulous stir fry and watch it disappear. Also, although I never add hot spices or sauce to my dishes now that we have the boys, my husband adds something spicy to his dish 99% of the time. He said Sriracha went really well with this particular meal. 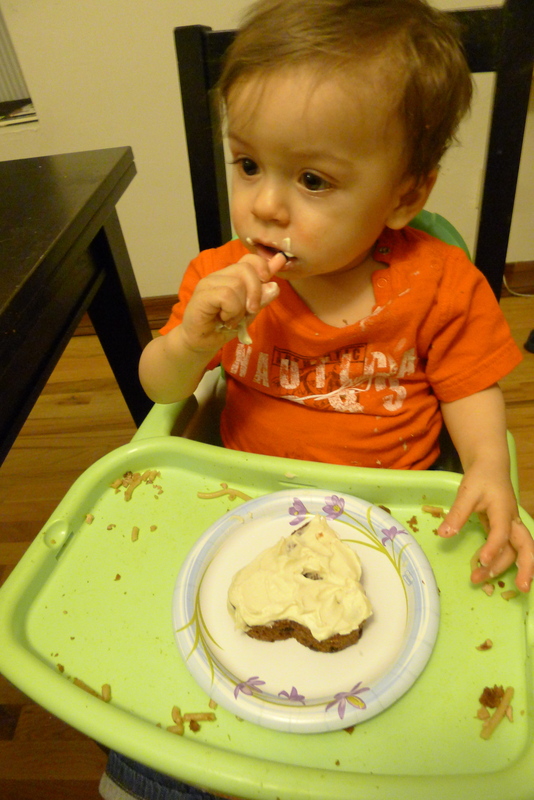 We celebrated Xavi’s 11 month birthday last night…which was one day after his actual birthday. I told you how I am feeling this week. Stop making me repeat myself. Anyway, I wanted to make a cake he could actually eat, so I made a carrot cake where I switched out the nuts for raisins. 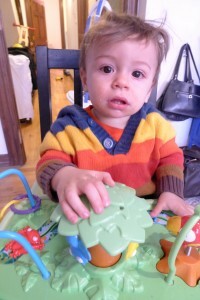 Because, you know, babies can’t eat nuts until they are 1 year old. (29 days from now. I know, kind of silly.) Turns out, Xavi hates raisins. At least I know now before I went making a huge raisin birthday cake for the real birthday. Oh, and I halved this recipe. Feel free to do the same. Or double it. (You again with the 6 kids?!) Personally, I know myself and would rather eat half of the half of a cake leftover the next day. Geez, Carlitos. 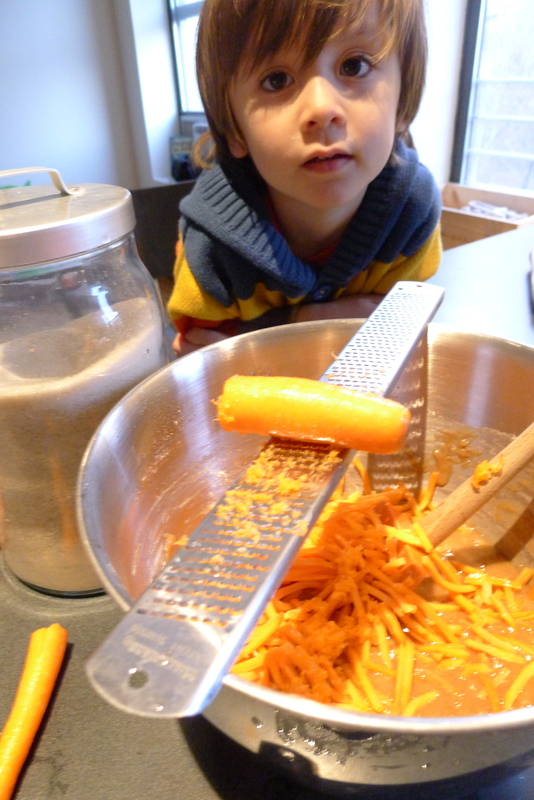 Stop looking so concerned about my chopped-off finger resting on the microplane. I mean, really. Don’t rush to call 911 or anything. Kids these days. To make the cake, mix together the sugar, oil and eggs in a large bowl. Separately, mix together the flour, baking soda, salt and cinnamon in a smaller bowl. Then fold the dry ingredients into the wet ones. Next, fold in the carrots and raisins. 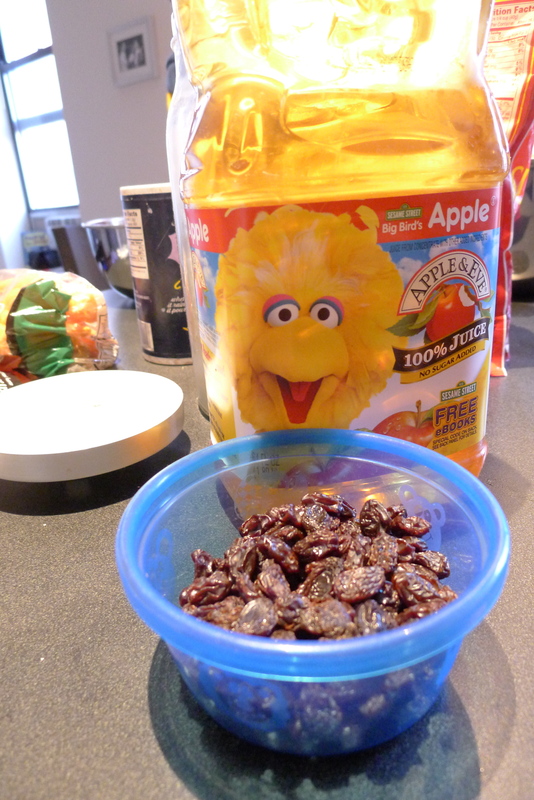 Let me say, that I experimented with the raisins. I wanted to ensure that they were plump in the cake, rather than still all shriveled and hard. (Someone always leaves that darn raisin container open. Boys.) Well, about 2.5 years ago I learned that when left in a moist and warm location, raisins will eventually plump up to their original grape size. (Don’t put to much thought into trying to figure out how I might have learned this. You genuinely do not want to know. Trust me.) Anywho, I had an idea! Look! Big Bird thinks it is a great idea, too! He’s just as excited as I am! Pour the batter into very well-greased pans and cook at 300 degrees for anywhere from 20 – 55 minutes, depending on how big or small your pan(s) are. 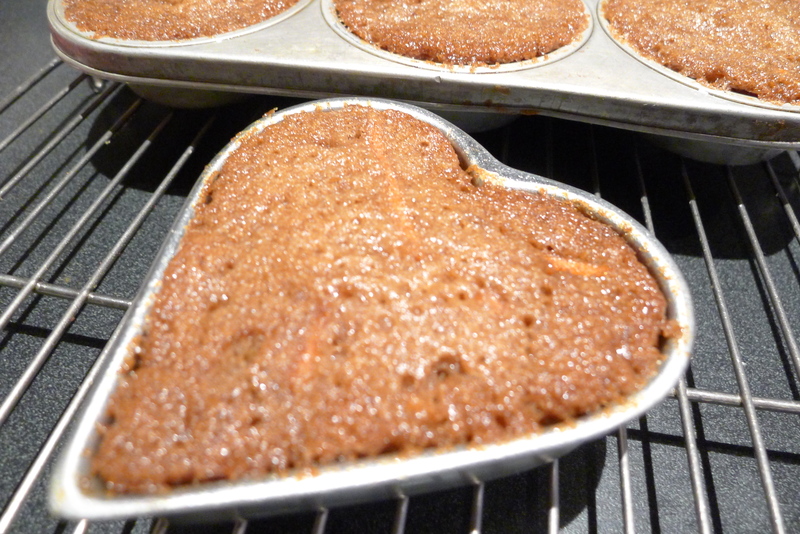 We used lots of different children-sized cake pans, as well as cupcake tins, so it was about 25 minutes. Just make sure a toothpick comes out of the center without any gooey batter clinging to it. When I tell you that these were so, so, so moist and spongy…and yet slightly crisp on the very outer edges, well, I tell you. This is me, telling you. Spongy, moist and crispy. End of story. Amazing. The frosting is even easier. You just mix together the above ingedients. Voila. Am I the only one that has an urge to ski down this and collapse at the pillowy bottom? In fact, it is actually even easier than that because I totally did not follow the amounts. 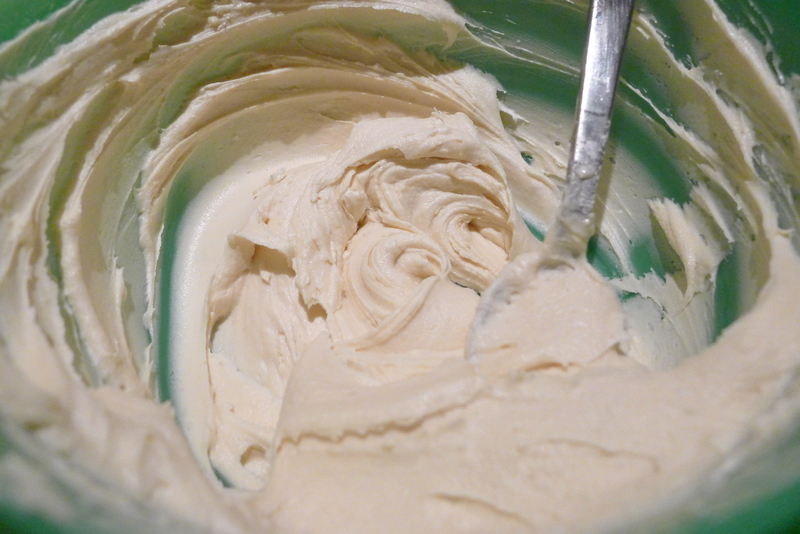 I put whatever we had left in our container of whipped cream cheese, a couple of spoonfuls of butter, vanilla (ahem, way too much vanilla. oops), and poured in some confectioner’s sugar. I literally have no clue what amounts I used. And it still tasted amazing. Well, except that I put way too much vanilla. But my husband said he actually liked it like that. Unfortunately, the only one who didn’t love the cake was the Birthday Boy. He would apparently, in fact, rather chew on a crayon candle than that raisin-filled carrot cake with vanilla cream cheese frosting! Well then, a wax crayon cake for your first birthday, it is, my boy. This entry was posted in What's for Supper Wednesdays and tagged baby bok choy, Birthday, nut-free carrot cake, suppertime, tofu stir fry, vanilla cream cheese frosting. Bookmark the permalink. Follow any comments here with the RSS feed for this post. Post a comment or leave a trackback: Trackback URL. I am channeling you tonight by a) making this for din (love the limited ingredients, it means I actually remember to get everything when I go grocery shopping AND I dont break the very small piggy bank) and b) doing a work out video (the poor mans P90X). Thanks for the weeknight inspiration!! Lastly, I am confused about your bunny/carrot reference…? Are you asking if I understand why Easter focuses on bunny rabbits and carrots? If so, I would say that the whole Cadbury Bunny laying eggs has me WAY more confused. ohhhhh, people are ofen confused by the association I have between carrot cake and Easter, so figured I would just put the bunny thing out there. Now I am craving a cadbury egg…..
Wait…do bunny’s eat carrots? I totally thought they just at lettuce. What I wouldn’t do for a Cadbury Creme Egg right now….